In this provocative volume, editor Safron Rossi - a goddess studies scholar, professor of mythology, and curator of collections at Opus Archives, which holds the Joseph Campbell archival manuscript collection and personal library - collects these lectures for the first time. 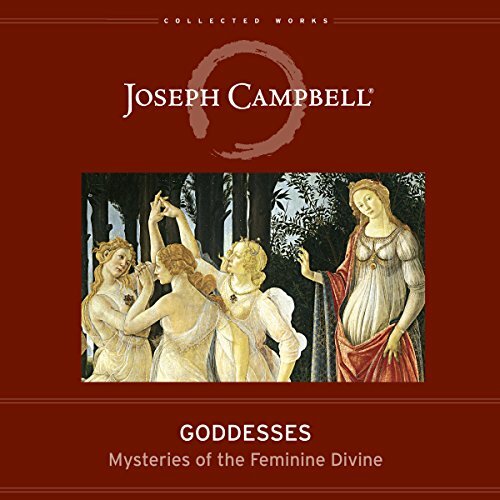 In them, Campbell traces the evolution of the feminine divine from one Great Goddess to many, from Neolithic Old Europe to the Renaissance. He sheds new light on classical motifs and reveals how the feminine divine symbolizes the archetypal energies of transformation, initiation, and inspiration. ©2013 Joseph Campbell Foundation (P)2018 Brilliance Publishing, Inc., all rights reserved. I started reading Joseph Campbell 1986. And I've never been able to get enough of him I read is first works was 8 years old and he's a Guiding Light to a very messy world. I really hope that the foundation continues to release collections from his work and lectures. Inspired by Joseph Campbell’s great Power of Myth series, I selected this audiobook to fill in that series’ gaps. It’s good but could have been better since it was assembled after his death under a goddess theme. Some lectures only include goddesses as accompanying characters, likely due to an effort to reach a time length. If you have a spare credit, you can’t go too wrong here but it will leave you slightly disappointed.